When my husband, James Cameron, was nominated for an Academy Award for Avatar in 2009, it was the perfect moment to shine the spotlight on an issue near and dear to my heart: the fashion industry's impact on the environment. And I was proud to show my support for the planet by wearing a gorgeous gown made from sustainable silk -- dyed Avatar blue, of course! What was so cool is that it turned that old red carpet question, "What are you wearing?" into a real conversation about the environment and the impacts of the fashion industry, one of the most polluting industries after fossil fuels and agriculture. We wanted to tell a story of how fashion could be beautiful and sustainable, from sketch to final creation -- with responsible fabrics, clean dyes and a humane manufacturing process. 1. Young designers are already changing the industry. Red Carpet Green Dress previous winners have told us they had never thought about the fashion industry's impacts or worked with sustainable fabrics before entering the contest. Now they're taking these ideas out into the world: past winners have gone on to write books about sustainable fashion and work at top houses like Chanel and Yves St. Laurent. 2. Natural dyes are the color bomb. If the phrase "eco fashion" calls to mind a baggy, dishwater-grey tunic, just take a look at the stunning gold dress worn by Naomie Harris at the 2013 Oscars. Made of Ahimsa silk dyed with chamomile and goldenrod and embellished with vintage beads, the gown designed by Michael Badger landed Naomie on several best-dressed lists. And we can't forget one of the highlights: working with Dame Vivienne Westwood and her genius idea to sew recycled chocolate wrappers into the gown. 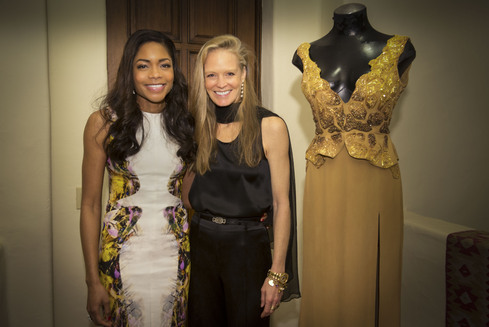 Naomie Harris at the 2013 Academy Awards wearing sustainable fashion design by Michael Badger on behalf of Red Carpet Green Dress. 3. Sustainable fibers feel hemp-tastic. I seriously don't like the weird feeling of petroleum-based polyester. And the past seven years have made me hyper aware of the havoc they can wreak on one's health and the health of the planet. When I wear natural fibers, it takes me back to my teens, when I lived in denim and cotton oxford shirts. Today I know many natural fibers aren't sustainably harvested, which is why I love wearing hemp. Hemp doesn't deplete the soil or require much water -- and it feels natural and comfortable on your skin. 4. Used can be beautiful. Vintage has been in vogue for years, but Red Carpet Green Dress opened my eyes to so many possibilities for recycled fashion, from re-using beads and zippers to incorporating other surprising and creative materials into designs. The Environmental Protection Agency estimates that 97% of post-consumer textile waste is recyclable, which inspired us to reuse lining from previous gowns for several years now. In 2014, we teamed up with Ekocycle, a company founded by recording artist will.i.am, working to create products with recycled plastic bottles. My husband Jim became a believer after wearing a recycled suit! 5. The red carpet is ready to go green. The designers aren't the only people changed by their experience with sustainable fashion. Many of our actresses say it has shifted their perspective as well. And I believe it's having an even wider impact. The first time I saw one of our "green dresses" on a best-dressed list, I was thrilled -- and stunned. But last year, when Manon Gabard's gorgeous peacock-blue gown for "Jane the Virgin" actress Gina Rodriguez was covered by The Hollywood Reporter, Vogue, and Elle, it seemed like the most natural thing in the world. Sustainable fashion isn't just a gimmick. It's beautiful, it's in demand, and it's here to stay. Seven years later, it is still a challenge to find affordable, environmentally friendly stylish clothes to wear every day. Always up for a challenge, though: my goal is to make that happen one day soon!